Bakery is a modern and functional WordPress Theme. It is designed for bakery, food or beverage company, bread shop, pastry shop or other similar businesses. The template is a perfect solution for pastry or pizza delivery services or any kind of cafe or restaurant. 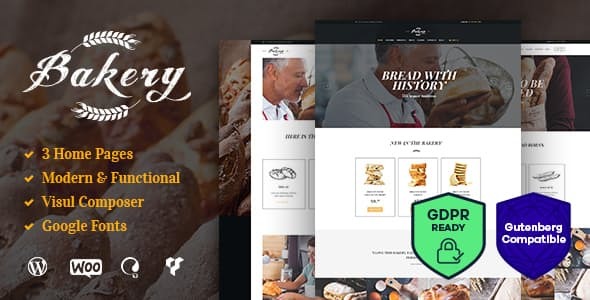 Bakery Theme is compatible with a bundle of premium plugins: Revolution Slider, Essential Grid, WPBakery Page Builder and WooCommerce to make it easy for you to setup and manage your bakery online shop. With an intuitive visual interface, you can make as many layouts as you can imagine. Bakery is fully responsive and Retina Ready theme, so it looks amazing on any platform.